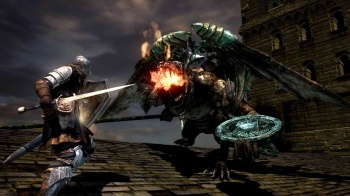 Namco Bandai just released the 1.05 patch for both the Xbox 360 and PlayStation 3 versions of Dark Souls and we've got details. Dark Souls isn't technically an MMO, and yet it flirts with the genre like a drunk co-ed rebelling against daddy. Thus, when the game gets a patch full of balance tweaks and subtle changes to the brutal adventure, fans of the game should prick up their ears and have a peak. The good news? This particular patch seems to make the game a bit easier. Don't get me wrong, it's still capable of turning even the most devout Buddhist monk into a swearing, screaming infant, but with the 1.05 patch Dark Souls has gone from "insanely hard" to merely "really stupid-hard." On behalf of everyone who has spent the vast, vast majority of their time in Dark Souls as a sunken-eyed Hollow, I'd just like to say "Gwyn be praised!" Pyro Glove nerfed from 270 to 230. You can see resonance signs now. Vow of Silence range increased. Sorcery spell damage as a whole was slightly buffed, but Homing Soul Mass and other pursuit style spells were nerfed. Magic Shield duration lowered to ~11 seconds. Strong Magic Shield duration lowered to ~11 seconds. Invincibility removed. Effect on Stamina drastically reduced. Tranquil Walk of Peace and other Slow duration reduced to ~10 secs. Effect supposedly changed from 100% encumberance to 50%. Rolling possible if your equip burden is lowered. Slowness is similar to swamp effect. Invisible Body duration remains unchanged. Defensive bonuses gained via Humanity reduced. Other defensive bonuses remain unchanged. Item discovery gained via Humanity improved. Capped at 20. Normal scaling buffed by 5-20% (20% at +14). Crystal scaling buffed by 5-20% (20% at +4). Lightning +4 nerfed by 2% (+5 remains unchanged). Raw scaling buffed by 10% (all levels). Magic stat scaling buffed by 10-20% (20% at +9). Enchanted stat scaling buffed by 15-20% (20% at +4). Divine stat scaling buffed by 10-20% (20% at +9). Occult stat scaling buffed by 15-20% (20% at +4). Dragon stat scaling buffed by 5-20% (20% at +5). Gold-hemmed nerfed, still can't be upgraded. Dust skirt nerfed hard (streamlined to match the other pieces). Silver Knights, Sun, Hollow Soldier's Shield and other medium shield stability nerfed to ~70 at max upgrades to improve Great Shield viability. Dragon Greatsword buffed from 360 to 390. Silver Knight's Sword lightning effect removed. Now enchantable. Lock-on changing/switching got easier (more responsive). Ring of Fog users can now be locked on. Damage reduced on some mobs? HP lowered on some mobs? Reduced acquisition range on normal enemies. Supposedly reduced poise on some enemies. Ghosts and Skeletons give souls now. Twinkling Titanite drop rate improved. Pyromancers in Catacombs drop Skull Lanterns. Darkwraiths in New Londo drop Dark Hand. You can see resonance signs. Some invasion restrictions possibly changed? Darkwraith upperlimit confirmed as unchanged. 1.05: Summon restrictions improved slightly again. Amount of souls the Master of the game gains changed. You can hit Select to rate messages. 1.05: Fixed 1.04 bug where summon signs were invisible. Covenant Material drop rate improved. Forest Hunter NPC farming remains unchanged. Dark Anor Londo NPC farming remains unchanged. Dragon-head glitch, snuggly, and magic shield glitches fixed. Fixed a bug where your inputs come out 1 second later. Fixed a bug where the second solaire event wont progress. Fixed a bug where feeding frampt a titanite stone then going over 99 resulted in having zero. Fixed some specific map areas where you'd get stuck or be unable to progress. Changed some english subtitles on the overseas port. So? What do you guys think? Awesome or super awesome?